I’ve started writing fiction again, with the intent to improve. But I know that simply “writing a lot”, while being a necessary condition to improve, isn’t enough. For a long time, I used the “project-based” approach to learning instead. This involves picking a project that uses the skills you want to improve, and implementing it. While it’s fun and sounds like you’ll be improving by doing this, the truth is that it’s only effective in the very early stages. There’s simply too much happening at once, and not enough repetitions, to be able to improve. What I should have been doing is deliberate practice. If you do any reading on self-improvement, it’s likely that you’ve come across the term “deliberate practice” before. If not, here’s a post summarizing it. How am I applying this to fiction writing? Simple: I find a short story (1000 words or less, on flashfictiononline.com), and I cut off the bottom 100 words without reading them. Then I copy the story into Gingko, read it, and list out a few ideas for endings, and then write my own version. Then, and this is very important, I read the original ending, and compare the two, writing notes on what I find. This simple exercise has already revealed my weak areas and where I need to focus. And it’s easy to scale up, to keep increasing the challenge level (write 20%, write 50%). Or to move the part I’m rewriting, to focus on writing beginnings, for instance. More importantly, it removes the major block of focusing on what to write, and allows me to focus on how to write it. I’m still working on my endings, but I’ll probably be writing about more deliberate practice exercises I come up with as I find more areas I need to focus on. Do you have any practice exercises that allow you to focus on one area of your writing at a time? Can you think of ways of applying this to other creative fields? It’s unavoidable that sometimes we’ll have to slog through a part of our writing that feels like a bore. Whether you’re ghost-writing a book for a client, writing your thesis literature review, or even when you’re smack in the middle of that novel you always wanted to write. Chances are you’ll hit a spot where you just… can’t … keep … writing. There are a hundred reasons why this might be the case, but today I want to tackle just one: boredom. Filling out your tax forms. Playing a mindless kid’s board game with your 3 year old nephew. Sitting in a hospital waiting room (in Quebec, this can stretch out for 6 hours+, even in the “emergency” ward). Meditating: just sitting and focusing on your breath. You can now export not just the whole document, but also “Current card & subtree” as well as any “Single column”. You can now export to MS Word as well (again, whole document or the options above). You can now copy and paste the currently selected card and it’s children, with the standard shortcuts. There have been plenty of bug fixes made and deployed, as well. I’m still having issues with the experience on macOS though (for instance, the menu doesn’t follow mac conventions, and neither does the app’s exit experience), but it’s getting there. If you feel you’re constantly reacting and putting out fires with your work, instead of working calmly and proactively on your priorities, you could benefit immensely from doing a root cause analysis (also know as the “5 Why’s”). It’s a simple technique, made even simpler by using Gingko to write it out. Write out the problem you’re facing, in the first card. Ask yourself “Why did this happen?”, and put down all the reasons you can think of, as a child of that one. For each of those reasons, ask yourself “Why did this happen?” again. Once you have uncovered not just the superficial reasons but also the deeper causes, you can edit those cards with potential solutions. 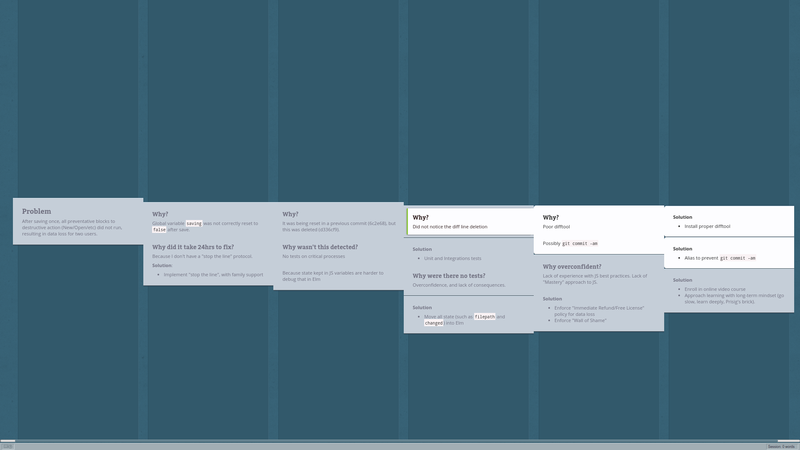 As an example, and in the interest of transparency, here’s my “5 why’s” for a recent serious bug with Gingko Desktop: after having saved once, doing something like “File > New” didn’t block to ask “Would you like to save your changes?”. It caused two users to lose a few hours of work, and it was a one-line bug fix. I made the fix, and deployed it to everyone. But instead of stopping there, I did a root cause analysis which exposed 9 different solutions that I’ve implemented that not only helped fix this bug, but also prevent similar mistakes in the future. If you find yourself scrambling a lot, and reacting to problems instead of working towards a goal of your choosing, try this. It doesn’t take much time, but it does require a lot of humility to see where you yourself went wrong. The Desktop version of Gingko is nearly ready to be launched! Export to Word, or any other format besides plain-text and JSON. It’s been a long road, but I’m happy with how it’s turned out. It might not be much different to look at, but it’s been rewritten in such a way as to allow much more powerful features to be built in the future. Check it out, let me know what you think, so I can iron out the last few bugs before announcing it to everyone on the full mailing list. Sometimes, we have no trouble starting a story or project, but we’re unable to stick to one for long enough to actually get it done. That’s fine if we’re just playing and exploring, but at some point, we need to learn to push for completion in order to grow. The trouble is that we tend to rebel against any restrictions on our freedoms. We might start out with enthusiasm, but you will hit a point where continuing feels like a chore. Freedom is important because it’s one of the few (if not the only) values that one can argue as being intrinsically good. Restrictions are important because constraints now can lead to freedom later. When used in this way, it’s called “self-control” or “discipline”. This tension between Freedom and Constraint is present whenever we have the power to choose. And we always have that power, even if it might not seem like it. So how do we resolve the tension? Are you reading several books a month, but somehow you “don’t have time” to write? Do you read for inspiration, but avoid writing even when it strikes? Now, I read this book more than once (of course!) but the first few times I did, that quote just slid right over me and made no impression. We’ve never owned a TV. My wife and I watch shows on Netflix at her prompting, not mine. I do watch a lot of productivity videos on YouTube, though… but at least that’s “productive” (notice a pattern?). It took another pass to finally see that those words were written for me… I just had to substitute “watching TV” with “reading” for it to apply. Ouch. I might not be a couch potato, but I’m the literary equivalent. An armchair beet? A rocking chair parsnip? Never mind… humor isn’t my strong suit. Must be all serious, all productive, all the time. Reading is worthwhile, it’s fun, and it does build perceptual exposure that can improve your writing. But the key is to focus on your production/consumption ratio. Seeing things as either production or consumption left me no room to hide. Reading classics of my chosen genre: consumption. Reading a “how-to” book on writing: consumption. Watching YouTube videos on time management: consumption. Consumption is fine, but it needs to be balanced with the appropriate amount of production. What’s “appropriate”? Enough that you feel satisfied. Since I started seeing things this way, I’ve started writing again after a hiatus of over a year.